Joseph Mazzulli, PhD, assistant professor of Neurology in the Division of Movement Disorders, was lead author on a study published in Neuron. Northwestern Medicine investigators have discovered how a gene mutation results in buildup of a toxic compound known to cause Parkinson’s disease symptoms, defining for the first time the mechanism underlying that aspect of the disease. 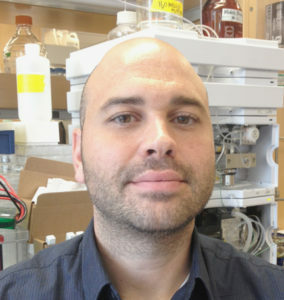 The study, published in Neuron, points to a potential novel therapeutic pathway using drugs originally intended to treat another condition, Gaucher’s disease, according to senior author Joseph Mazzulli, PhD, assistant professor in The Ken & Ruth Davee Department of Neurology, Division of Movement Disorders. In Parkinson’s, a protein called alpha-synuclein is converted to insoluble, toxic clusters in the central nervous system — but the exact mechanism of conversion was unknown until now. One of the strongest risk factors for developing these clusters is a mutation in the gene GBA1, which normally degrades a lipid called glucosylceramide. Patients with one mutation in the gene suffer an increased level of glucosylceramide and have been shown to have a five-fold increased risk for Parkinson’s; patients with two mutant forms of the gene, one inherited from each parent, can develop Gaucher’s disease, a lysosomal storage disorder. Mazzulli and his colleagues used this genetic connection to elucidate the mechanism of GBA1-influenced Parkinson’s disease. 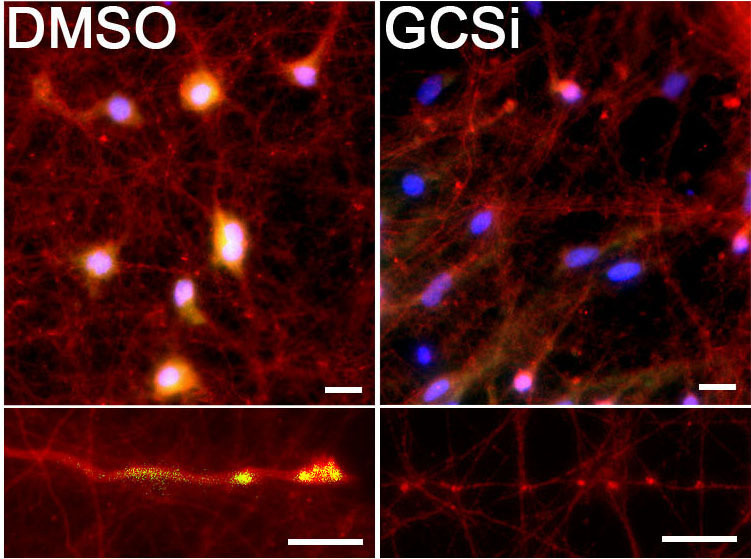 Using stem cell models of neurons, they used a pharmacological inhibitor to increase levels of glucosylceramide without a mutated GBA1 gene. Even without the mutation, this resulted in a dramatic build-up of toxic alpha-synuclein in neurons. “This suggested to us that the critical factor in converting alpha-synuclein from its normal form to its pathogenic form was not necessarily the presence of the mutated GBA1 protein, but more importantly the decreased activity and accumulation of glucosylceramide,” Mazzulli said. With that realization in mind, the investigators took a closer look at the conversion process, finding the healthy form of alpha-synuclein actually existed in two different forms, a simple molecule and a more complex molecule. While it was assumed previously that only the simple molecule was converted into the toxic variety, Mazzulli and his colleagues unexpectedly found the complex molecule was directly converted by glucosylceramide into toxic alpha-synuclein. These discoveries suggest that future therapies targeting this pathway might utilize drugs originally intended for treating Gaucher’s disease, Mazzulli said. While the pharmaceutical industry has been interested in the use of those lipid-reducing agents for some time, this study defines the molecular process behind those efforts and demonstrates how it might work. 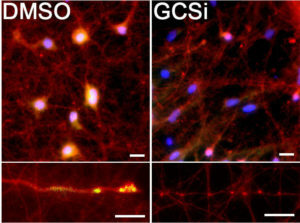 Lipid reduction using an FDA-approved glucosylceramide synthase inhibitor (GCSi) reduces pathological alpha-synuclein in cell bodies (top) and neurites (bottom) of Parkinson’s patient neurons. Yellow staining indicates pathological alpha-synuclein. In addition, the study gives future drug trials an important metric to measure success, Mazzulli said. The next step towards a functional treatment will be to graduate from stem cell-derived neurons to animal models, according to Mazzulli. The first author was Friederike Zunke, PhD, a former postdoctoral fellow in the Mazzulli lab, who has now moved on to lead her own group at the University of Kiel in Germany. This study was supported by the National Institute of Neurological Disorders and Stroke grant R01NS092823, Northwestern PDMD Advisory Council, the Michael J. Fox Foundation grant ID 12158, and the Human Embryonic and Induced Pluripotent Stem Cell Facility at Northwestern.